Danish author and politician; born at Copenhagen, Oct. 21, 1847; brother of George Brandes. At the age of eighteen he entered the university of his native city, and at first diligently followed courses in Oriental and comparative philology, devoting himself especially to the study of Persian and Sanskrit. His taste for dramatic art, however, soon got the better of his philological pursuits, and upon graduation from the university he gave himself over entirely to writing, beginning his new career by the translation of two dramas from the Sanskrit. Gradually he developed an intense interest in politics, and while he continued to devote himself with undiminished enthusiasm to dramatic art and criticism, he plunged into an active political life, which resulted in his election in 1880 to the Folkething by the Democrats of Rudkjöbing. About this timeappeared his volume of character-sketches and studies on Danish dramatic art, "Dansk Skuespilkünst," Copenhagen, 1880, followed by a series on foreign dramatic art, "Fremmed Skuespilkünst," ib. 1881. Brandes wrote a number of excellent plays, the chief merit of which lies in the psychological analysis and clever delineation of the characters involved. The following were the most successful of his productions that were performed on the Danish stage: "Lægemidler," 1880; "Gnygende Grund," 1882; "Et Besög," 1882 (a second edition of this play was published in 1884, and was later translated into German by Hoffory, Berlin, 1889); "En Forlovelse," 1884; "Et Brud," 1885; "Kjærlighed," 1887; "Overmagt," 1888; "Under Loven," 1891; "Asgerd" and "Mohammed," 1895; "Primadonna," 1901; besides his dramatization, in 1883, of the Norwegian novel "Garman and Worse" by A. L. Kjelland. 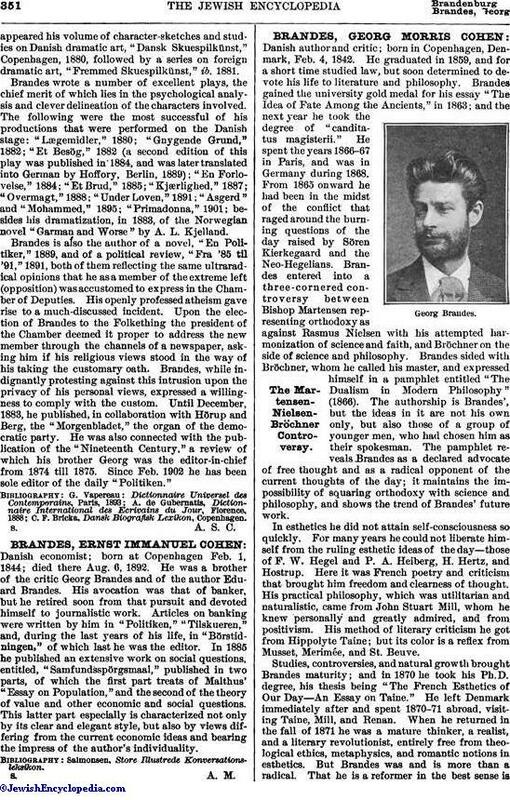 Brandes is also the author of a novel, "En Politiker," 1889, and of a political review, "Fra '85 til '91," 1891, both of them reflecting the same ultraradical opinions that he as a member of the extreme left (opposition) was accustomed to express in the Chamber of Deputies. His openly professed atheism gave rise to a much-discussed incident. 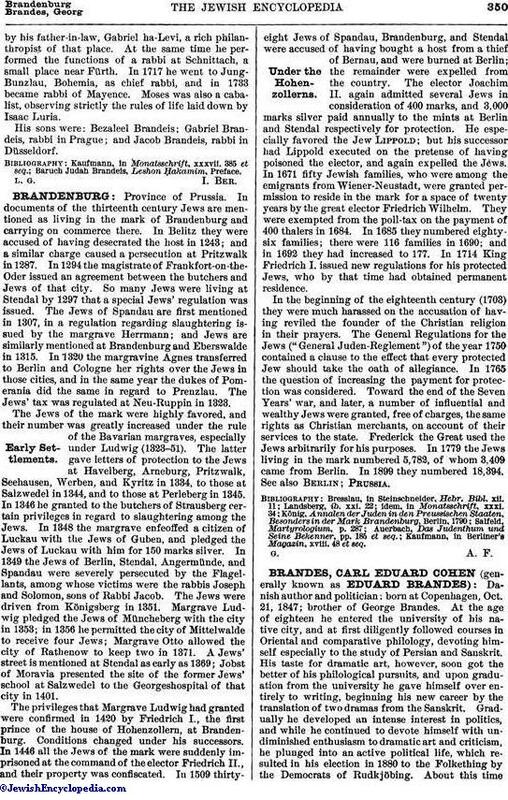 Upon the election of Brandes to the Folkething the president of the Chamber deemed it proper to address the new member through the channels of a newspaper, asking him if his religious views stood in the way of his taking the customary oath. Brandes, while indignantly protesting against this intrusion upon the privacy of his personal views, expressed a willingness to comply with the custom. Until December, 1883, he published, in collaboration with Hörup and Berg, the "Morgenbladet," the organ of the democratic party. He was also connected with the publication of the "Nineteenth Century," a review of which his brother Georg was the editor-in-chief from 1874 till 1875. Since Feb. 1902 he has been sole editor of the daily "Politiken." C. F. Bricka, Dansk Biografisk Lexikon, Copenhagen.